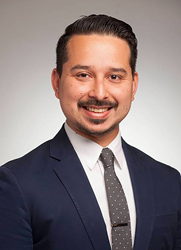 Roy Herrera has joined Lewis Roca Rothgerber Christie LLP as Of Counsel in the firm's Litigation practice group. Herrera’s background includes representing clients in complex litigation, including matters involving class actions, securities and business disputes. He has also represented clients in white collar criminal defense matters and government enforcement actions. His experience also includes advising nonprofits, businesses, PACs, candidates and elected officials on campaign finance and election law issues. Prior to joining Lewis Roca Rothgerber Christie, Herrera served as an Assistant U.S. Attorney for the U.S. Department of Justice in Phoenix, and on the legislative staff of U.S. Representative Ed Pastor in Washington, D.C.
Lewis Roca Rothgerber Christie LLP is an Am Law 200 commercial law firm for handling complex matters in government contracts, litigation, intellectual property, business transactions, gaming, government relations and other practice areas. Lewis Roca Rothgerber Christie offices are located in Albuquerque, Colorado Springs, Denver, Las Vegas, Los Angeles, Irvine, Phoenix, Reno, Silicon Valley and Tucson. For more information, visit lrrc.com.